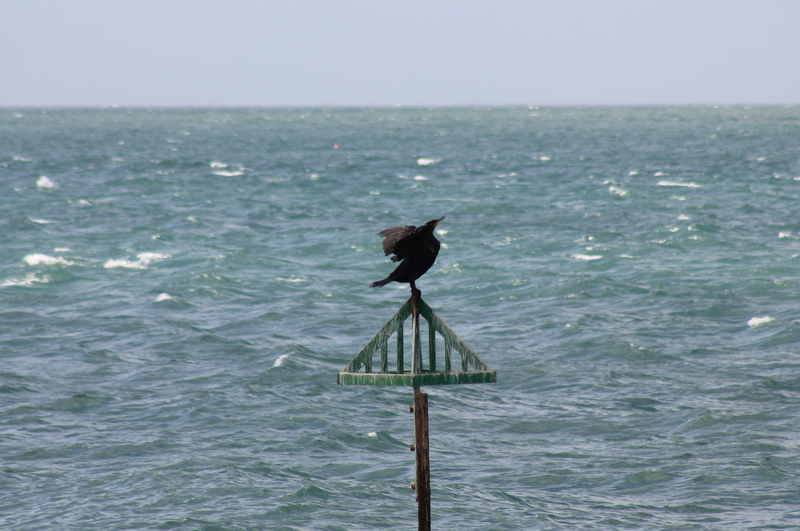 As we walked out of Selsey we passed one of those ubiquitous posts with a funny triangular metal thing on top. Here it is – with a cormorant drying out in the sun. These posts are all over the place, and when the tide is in they attract cormorants. These birds can perch safely whilst surrounded by water, wings outstretched, drying off before they go back to hunting. So many of these posts have cormorants perched on top of them that your attention is drawn away from the structure itself. It suddenly occurred to me: what are these strange triangles on top of the groyne posts? For nearly 500 miles we have passed these things without knowing what they actually are. Some posts have triangles, and others have circular red things looking like upside down fire buckets. The posts sit at the end of groynes, so I suppose they are there to provide a warning about submerged timbers at high tide. My guess is that the red fire buckets are used because they are obvious and easily visible, but what about the triangles? Google is a modern-day repository that has an answer to most things. I typed in “post triangle beach” and clicked “Search”. The general search returned an abundance of articles about the Bermuda Triangle. This did not provide the enlightenment I was looking for, so I tried a Google Image search. This time the search returned an abundance of bikini-clad women in various poses on golden shorelines. For a moment I stared at these images in a discombobulated stupor. Why would my search result in these images? Then I realised – bikini tops are essentially made out of two triangles. Go on – do a search! You’ll see! I considered changing my Image Search to “groyne triangles“, however, a deep-rooted fear washed over me like like the Selsey tide. If “post triangle beach” returned bikini-clad women, what would “groyne triangle” return? I gave up. This blog is not supposed to be about issues such as this, but I am completely stumped. This entry was posted in West Sussex and tagged coast, cormorant, Google, groyne, selsey, travel, triangle, walking, west sussex. Bookmark the permalink. Given that the US spelling of ‘groyne’ is ‘groin’ – and Google tends to search on both just to be helpful – I’m sure your Google search result would have been very revealing. results, it doesn’t seem much improved! But did you find any bikini-clad women in various poses on beaches?!? Jill – That’s odd – I just tried “post triangle beach” on my work computer and that also returned images of bikini clad women. I would recommend you take your PC into the shop and get it looked at – clearly there’s something wrong with it. If my computer was behaving like yours I’d be extremely upset! Jill – Please remember that people from all over the world are reading this. Every time you say that you do a Google search and DON’T come up with bikini-clad women, people are wondering what sort of cookies I have on my computer, and why. I implore you: try “triangle post beach” and report back – otherwise I shall be viewed with suspicion wherever I go in the world! was doing in the results???? I’m so glad that other people have given the solution to this vexed Q by way of comments. Although not realising it, this unresolved query must always have been at the back of my mind, reanimated by your post. Now I know the answer, I’m off to try my luck with Groyne Triangles (it may be part of a minor percussion event at a local orchestra somewhere). I accept no liability whatsoever in respect of the search results. You undertake this search at your own risk!